Legal sports betting got a rousing New Jersey welcome Thursday morning at Monmouth Park. Beyond the pomp and circumstance of politicians and other dignitaries, there was a throng of several hundred eager bettors ready to get their wagers down at the William Hill US sportsbook. “I’m hoping for thousands today,” said Dennis Drazin, CEO of Darby Development, which operates Monmouth Park. By day’s end, he surely hit that number, as sports bettors flocked to the book and the adjacent race and sports bar at the renowned horse racing venue. Drazin and William Hill US CEO Joe Asher were key players in bringing Thursday’s festivities to fruition. Drazin’s property devoted a hefty footprint and $3 million in upgrades over the past few years, on the hopes that ultimately sports betting would be legalized in New Jersey. And William Hill joined in on the investment, long before last month’s Supreme Court decision that declared the Professional and Amateur Sports Protection Act of 1992 unconstitutional, thereby opening the door to expanded legal sports betting. “I read some comments back in 2012 from a guy named Dennis Drazin,” Asher recalled of when he first became aware of Drazin and his quest to host sports betting at Monmouth. “So I cold-called him and introduced myself, then went out to meet him and sat with him in his box at Monmouth to watch the races. We started talking about the idea, and we signed a contract in 2013. Thursday morning. Lesniak, who spent 40 years in the state Legislature, did much of the heavy legal lifting to get sports betting in his home state. On May 14, that judicial body found in New Jersey’s favor. The Legislature then guided through a bill that arrived on Gov. Phil Murphy’s desk on Friday, and he signed it into law on Monday. Then the governor threw down the ceremonial first wager – actually, two wagers. Germany is a good investment, at 7/2 one of the favorites in the tournament that started shortly after Murphy’s wagers. The Devils, meanwhile, are a 40/1 long shot to hoist the Cup next year – a nice homer bet for the savvy politician, and if it somehow hits, he’ll cash out for $800. Shortly after the governor got down, it was time for public bettors to take over the joint. They were extremely eager to do so, and grateful for the new opportunity. So what was he on for this historic occasion? His Ben Roethlisberger jersey gave away at least part of his intentions. 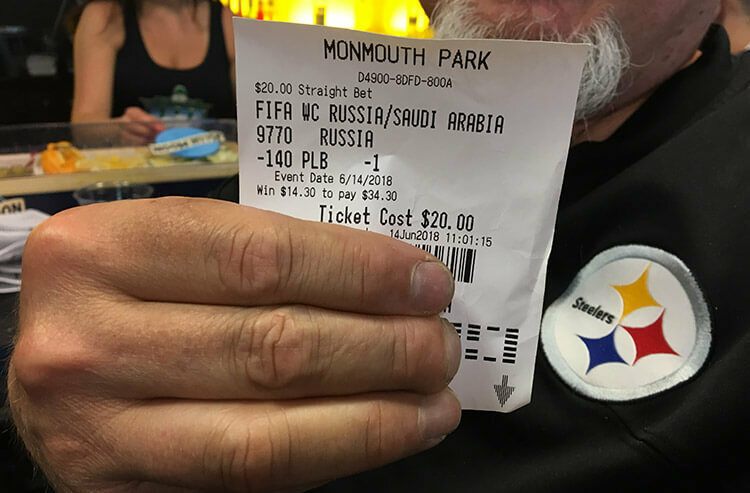 “I’m betting a bunch, but my main bet is gonna be $100 on the Steelers to win the Super Bowl,” Pniewski said. He also dropped 20 bucks on Russia -1 goal against Saudi Arabia in the World Cup opener, easily cashing in a 5-0 victory. Greg Visone of Millburn N.J., about 30 minutes from Monmouth, was also happy about a much shorter trip to the betting window. Visone, who also jumped on Russia minus a goal and collected on that wager, tipped his cap to the legislator who made this all possible. And although the labor was closer to nine years than nine months, Lesniak was a proud papa on Thursday. For those watching those newly minted betting boards in New Jersey, the Giants are 35/1, and France is 11/2.